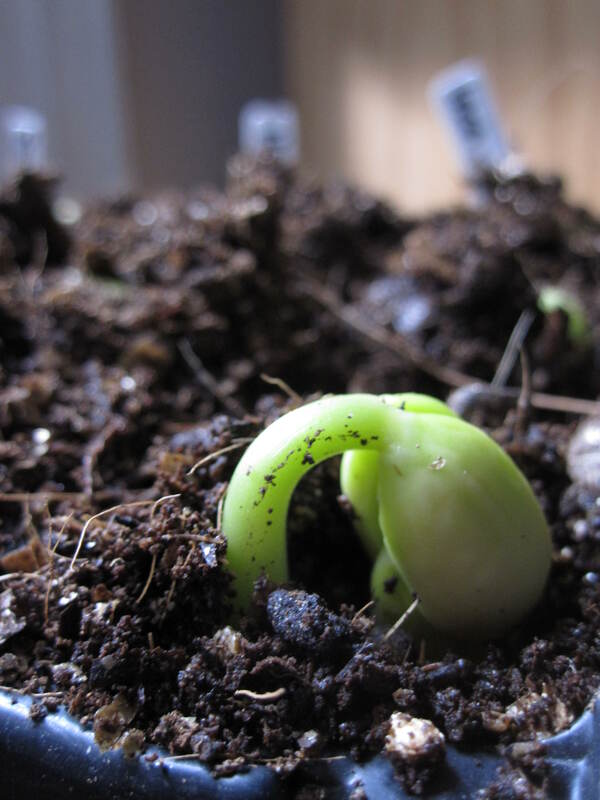 Watching germination is a real joy. April to May is the time to start growing pumpkins and beans crops under cover, that’s to say, in a green house or poly tunnel, or at home on a sunny windowsill. Plants will be ready to swap and be planted outside towards the end of May after all risk of frost has passed. So be patient. 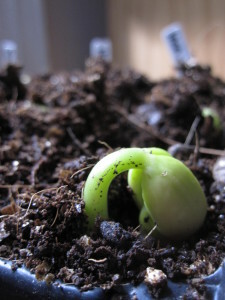 If you sow the seeds too soon your plants will get rangy, outgrow their pots and you’ll be yearning to put them outside. If there’s a frost, they may die, but even if it’s just cold they will be checked, meaning growth will stop and take longer to start again. You might as well have just started them at the time that suits them: April to May. Seed compost is ideal as it’s not too rich in nutrients (the seeds have all they need to get started) and not too full of big bits. Potting compost, which is cheaper and easier to get, has big bits but you can sieve it or pick them out.for instance, but make sure you put holes in the bottom for water to drain out. Plants need the air spaces between soil particles and don’t want to be waterlogged. Fill your pot loosely, tap the pot on the table to settle the compost a little, then push the base of another pot lightly but firmly down on the top of the compost. This will consolidate the compost so roots have something to push against. Make a hole about 2cm deep with your finger and push the seed in. Don’t worry too much about the direction, except best not to put a pumpkin seed flat as water might just pool on the surface and rot it. 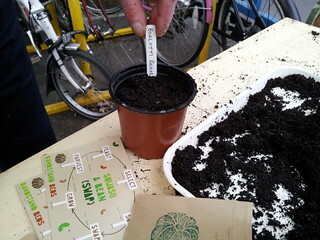 Pinch the soil over the top to cover the seed. Place the pot in a tray or punnet and fill it to about a centimetre up the side of the pot. The compost will absorb the water. Look at how the compost looks. Like this or a tiny bit drier is how you want to keep it. Continue to always water from the bottom to encourage strong root growth downwards. For swapping, plastic 9cm pots are the most robust – we want you to bring the pots to swap events (click) and take them away again. Paper pots are a nice idea but not so robust for swapping. Root trainers like these (click) for beans are excellent but expensive and useless for swapping!